Apple launched a new series of Macbook Pros- two of them 13 inch and one 15 inch. The tech giant claims that these are the ‘thinnest ever Macbook’ and are nearly 20 percent smaller in volume compared to the previous models. Following are the features of the new laptops, which are immediately available for pre-order. Shipping is expected to start in early-mid November. Four USB-C ports, instead of the standard USB port. These ports can be used for charging the laptop or to attach USB-C, Thunderbolt, HDMI and USB connectors. Price: 15 inch Macbook Pro- USD 2,400; 13 inch model- USD 1,800 (with Touch Bar and Touch ID); the other 13 inch model which replaces the MacBook Air is relatively cheaper at USD 1,500. It does not have the Touch Bar or ID, though. I have no idea why Apple has strangely decided to call it also as the Macbook Pro. 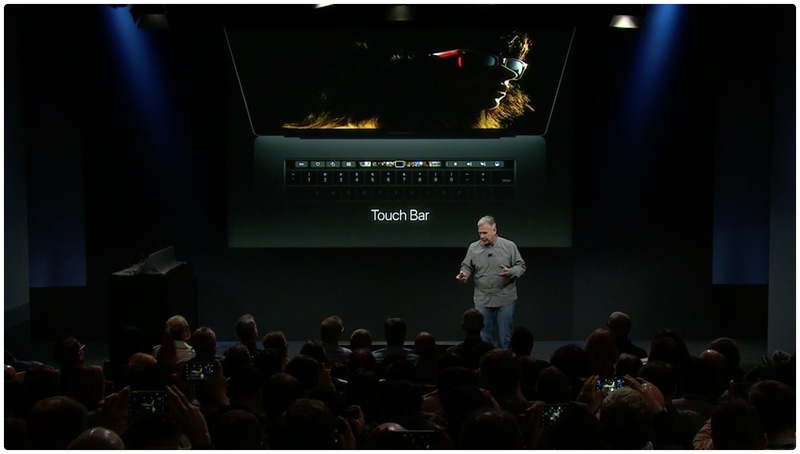 The new Touch Bar was undoubtedly the most exciting part of the event. It is a retina display bar in the form of a strip that replaces the function keys located at the top of the keyboard. It responds to touch and gestures, and the buttons on the strip can change according to the program that is being used. For example, website shortcuts and bookmarks will be displayed when you are using a web browser, as well as additional options to adjust the brightness, navigate to a different websites, editing controls for photos, volume control while listening to music etc. Users can control what defaults they want for their Touch Bar, and this includes system controls also. According to Irish programmer and developer Steven Troughton-Smith, the Touch Bar is being powered in the same way as an Apple watch. ‘From everything I can piece together, the T1 chip in the new MacBook Pro is a variant of the system-on-a-chip used in the Apple Watch. Running watchOS on the T1 lets the Mac benefit from Apple’s deep work on iOS embedded security, as the T1 gates access to the Touch ID sensor and, from the looks of it, the front-facing camera in the new MacBook Pro too,’ said Troughton-Smith, in an interview with The Verge. Apple has also integrated the Touch ID in the new Macbook Pros right along with the Touch Bar, and it is built into the power button. The Touch ID has the same second-gen Touch ID sensor as in the iPhone 6S/7 with a sapphire cover, and comes with a new T1 chip with a local secure enclave for Apple Pay security. It can be used to unlock your computer and used to quickly switch between accounts on multi-user machines with a simple button tap. What is the USB-C Port? USB-C can be considered to be a more evolved form of the USB port. It has a similar plug on both ends and is distinctively smaller than the older version, with rounded edges, and can be connected interchangeably. The USB-C has a top speed of 10Gbps and power output of up to 100 watts, which means that the MacBook Pro (that needs about 60 to 85 watts of power), can be easily charged through the port. Since the cable works in two directions, the devices plugged into the laptop can also be used for charging purpose. Following the release of the new MacBook line, one might have expected some cheer from investors. However, the lack of truly innovative tech and lower-than-expected iPhone sales have weighed into the investor sentiment, with Apple stocks further falling 1 percent to USD 114.48, just after the event. This comes after the company reported its first ever decline in revenue and profit in 15 years, with annual sales dwindling 8 percent to USD 215.6 billion in the year-to-date through September, and profit decreasing 14 percent to USD 45.7 billion from the last year.